The one Association for all who currently work, or have worked, with Service Children's Education abroad. Are you currently working as a teacher or a locally employed member of staff, have you recently left, or will you soon be leaving SCE? Have you worked for any of SCE's predecessors, such as SCS, SCEA or BFES? If so then you are eligible to join. This is an opportunity to keep up with friends, present and former colleagues. It will allow you to keep up with what is going on in SCE around the world. There are also opportunities for you to enjoy professional and social functions. 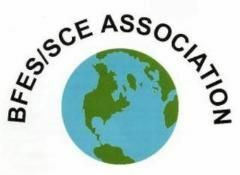 Please consider seriously joining the BFES-SCE Association! A copy of the quarterly newsletter is sent to every SCE school. Have access to the growing archive stored at the London University's Institute of Education. Receive the termly Newsletter of the Association, and contribute to it. Barbara Arrandale has been awarded an MBE in the New Year's Honours list for "services to the community in Hasland Derbyshire". and many off you came, enjoying an efficient and friendly AGM and an excellent lunch afterwards. Thanks go especially to Sue Adams for the organisation and liaison with Queens Hotel. Your web-master hopes to add some photos before long! At the meeting the existing committee was re-elected. In addition, Gareth Morgan was co-opted onto the committee. Good homes wanted before they become firewood! Your webmaster was able to liberate the plaques and boards below from the 'portacabins' at Upavon, late in 2015. They are too large for our archives and good homes are sought. Offers please to the web-master. Delivery almost anywhere in UK may be possible. ​Here below is #1 of an occasional series ... 'Spot the school' ! ​For a bonus.... what decade? The school is Haig School, Gutersloh. I was therein the 80s. I think this may be 1990s? It is indeed Haig School, but a few years later - this picture was 2003, I think. The car mirror is my 2000 purple Skoda Octavia (still running in 2018, several registrations later & recently spotted with Spanish plates in Fuengirola). Haig's head from mid 90s until late 2003 was Brian Ashton. Mike Chislett took the school on for most of 2003/4 and then Tony Berwick was appointed from UK (Milton Keynes). Tony oversaw a major overhaul to the building, which included a new office and reception area where the blue sign and fir tree are in the photo. ​Your web-site editor thanks Tom and wonders what a suitable prize might be? Perhaps one of the fine boards on the left? Meanwhile, on right is another school .... any takers? Here above is #2 of the occasional series ... 'Spot the school' ! There were no winners to this one .... it is Hackedahl, in Detmold .... this picture dates from about 2005, long after the school and the housing estate it served had been handed back. When the photo was taken, the building was in use as a youth centre. ​Below: A picture found & enlarged! Chris Webster (Secondary I/A); Jan Coates (Ad T); Cyndy Lancaster (I/A Early Years); Paddy Powell; Brenda Titley (cook); ??? ; Christine Caulfield (Ad T); Cheryl Williams (Ad T); ??? ; ???. ??? ; Paul Rogers (Staff Dev Officer); Ian Forrest (Senior I/A); Richard Vaughn (Ad T); Jan Fisher (St Dev Off); Andrew Gavin (Ad T); Marian Jones (Ad T); Diana Batt (I/A Early Years); Oswin Hall (I/A Primary); David Harfield (I/A Secondary); Stuart Dyke (Staff Dev Officer). when schools close, history is lost unless documentary material is collected, boxed and given to us! We (or at least, Walter - our archivist - sift and catalogue, then transport the priceless records to the Institute of Education, in London. Once safely there, any future historian and ex-teacher, pupils, parent) can gain access, subject to data protection rules. Here are some examples from Blankenhagen's closure in 2016. Blankenhagen Primary School, had previously been named Andrew Humphrey School. When RAF Gutersloh became Princess Royal Barracks, the school changed name; Griffin School at RAF Wildenrath took on the title of 'Andrew Humphrey'. This sculpture was created by the children of Ark primary School (JHQ), in 2013 and has been on permanent display at the National Memorial Arboretum, Staffordshire, since 2016. Since November 2017 it has sported an explanatory sign and a 'QR' code' linking to a simple web-page. Much of the information on this web-site and in the Association's Newsletters comes from the attics/albums of ex-teachers' own memorabilia which they have kindly donated. This history of our schools eventually makes its way into our archives held at the IoE at University College London. Below are two examples of such donations, from Marian Andrews (Nee Riley) of her colleagues at Marlborough First School, Osnabruck; 1981 - 1884. Peter Owens, Kate Johnson, Sheila McCafferty, Charlotte Wilkinsin, Marion Riley, Mary Brennan, Eileen Hilton, Glyn Pascoe. ??, ? ?, Sheila McCafferty, Marian Riley, Paula Clarke, Lesley Bayley, Sue King, Dawn Turner, Patsy Hope, Viv Evans, Joan Hunt, Peter Owens, Jinty Cowie, Anne Robbins, Moira Nicholl. Summer 2015 saw the closures of the schools in Hohne/Fallingbostel Garrisons. The final box of material from Gloucester School, Hohne was deposited on in November 2015. Some examples are included on our Archives page.
" The new Director of BFES was John Trevelyan who was a brilliant administrator and very capable of handling Commanding Officers to secure buildings on army sites which would make satisfactory schools. We were able in the first year (1947) to establish, with the help of the army, having schools form Flensburg on the Danish border to Frankfurt in the south and Berlin in the east." ﻿- extract from the brief memories of Arabella Kurdi (nee Pallister). More on the Archives page. - contains multifarious items, including documents, photographs, records, memorabilia and artefacts. This archive is constantly being added to and is proving of great interest to historians as well as to members of the Association. With a number of schools currently closing due to the reduction of bases we would ask staff in those schools to send log books, photographs, documents etc to the Association's Archivist as part of your close-down procedure. This material has a significant historical interest for the future. Your web-master has also moved a number of items from various other pages of this site - mainly photographs to 'Archive 2', so that nothing is lost as I gradually re-organise this wonderful web-resource. The final staff of Windsor School Rheindahlen on its closure in 2013. Can anyone add more details? It looks like Cyprus. Schools operating today - Go to the 'Schools' Page and open the link to give you access to all the schools websites showing how they operate today and catch up with their day to day activities. All the schools in the Hohne/Fallingbostel area closed in July 2015. They have contributed a significant amount of material to the Association's Archives. Much of this has been deposited with our professional archivist colleagues at the Institute of Education, University College, London. Just click on the relevant link to open a new e-mail message.